We heard news as "Few of Chennai based Self Financing Colleges are also announced Holiday on 21 October 2013 (Monday) for convey their condemns to the Murder of Infant Jesus Engineering College Principal Mr.Suresh Kumar”. In Kanyakumari District, All the Self financing colleges are decided to close the colleges for one day (21.10.2013 – Monday) to convey their condemns to the Murder of Infant Jesus Engineering College Principal Mr.Suresh Kumar. The Principal of Infant Jesus Engineering College in Tuticorin was allegedly hacked to death by students. The principal was hacked to death in the college on Thursday morning allegedly by three students who were ordered to vacate the hostel on grounds of indiscipline. 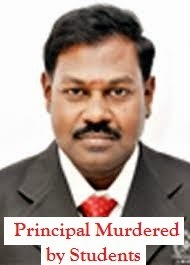 Police said the Principal Suresh (55) of Infant Jesus College of Engineering at Vallanadu died on way to hospital. The three students have been arrested, they said. Police said initial investigation found that the principal had asked the three students to vacate the hostel, following complaints of alleged ragging and certain other acts of indiscipline. Enraged by his directive, they hacked him to death, police said.